Lady and the Tramp (Buena Vista, R-1980). One Sheet (27" X 41") and Pressbook (Multiple Pages, 10.5" X 14"). Animation. Starring the voices of Peggy Lee, Barbara Luddy, Larry Roberts, Stan Freberg, Verna Felton, Alan Reed. Directed by Clyde Geronimi, Wilfred Jackson and Hamilton Luske. 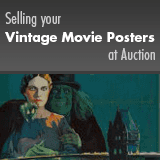 An unrestored poster and pressbook that display signs of use. May include light edge or fold wear, slight fold separations, very minor paper loss, pinholes, or unobtrusive stains. Please see full-color, enlargeable image below for more details. Folded, Fine/Very Fine.